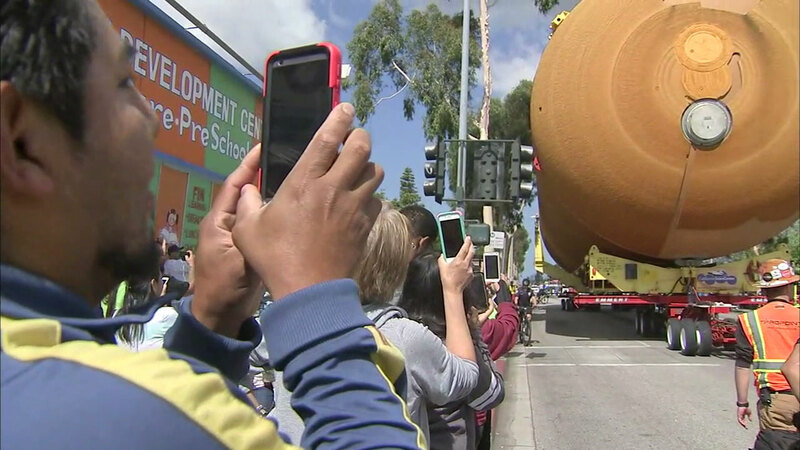 LOS ANGELES -- NASA's space shuttle fuel tank ET-94 has come home to the California Science Center, arriving after a slow journey through the city that was watched by thousands of cheering Angelenos. The 66,000-pound tank was towed 19 hours through the streets of Los Angeles, leaving Marina del Rey around midnight and traveling 16.5 miles to the California Science Center by 7 p.m. Officials held a brief ribbon-cutting ceremony to mark the occasion before it completed its trip. It was moving day Saturday for NASA space shuttle fuel tank ET-94 as it began to make its way from Marina del Rey to the California Science Center in Exposition Park. The tank will eventually be set up with the space shuttle Endeavour in a display replicating the space vehicle's launch position. Endeavour was similarly paraded through the city's streets in 2012, although its massive size made the effort more difficult, requiring the removal of trees and power lines. Several NASA astronauts joined the tank on its journey, greeting young kids who lined the streets to watch. "It really represents the hard work and effort of human beings in the United States putting together an absolutely wonderful vehicle," said astronaut John "Danny" Olivas, who flew two shuttle missions. Astronaut Mike Fincke said he hopes watching the tank move through the streets will inspire some of the children. "When I was a kid, I watched people walk on the moon. Kids today are going to remember this and it's going to help inspire them," said Fincke, who flew one shuttle mission and holds the American record for second most time spent in space. The tank left New Orleans in April, traveling by boat through the Panama Canal before it arrived in Marina del Rey. The tank's journey led to several road closures as crews navigated the massive tank through the streets at speeds around 3-5 mph. A map of the journey NASA space shuttle fuel-tank ET-94 will make on Saturday, May 21, 2016. The tank itself was never used on a shuttle, making it the only one available from the program. Those that were used ended up in the Indian Ocean. The NASA space shuttle external fuel tank, known as ET-94, headed through the streets of Los Angeles Saturday to its final destination at the California Science Center. Southern California Edison said customers would not be affected by the move.